Even though Fall has officially taken over the internet, we had an amazing 80* weekend here in Northern California and I couldn't resist one more taste of summer! If you remember, I participated in the Ice Cream Craving campaign with Tillamook a few weeks ago, and created these yummy Ice Cream Sandwiches. Unfortunately, those only lasted about two days in our freezer. But I was smart enough to freeze the leftover berries from Farm Box SF, and we still had quite a bit of Oregon Blueberry Patch and Strawberry Ice Cream, so I knew I could create a yummy frozen treat! 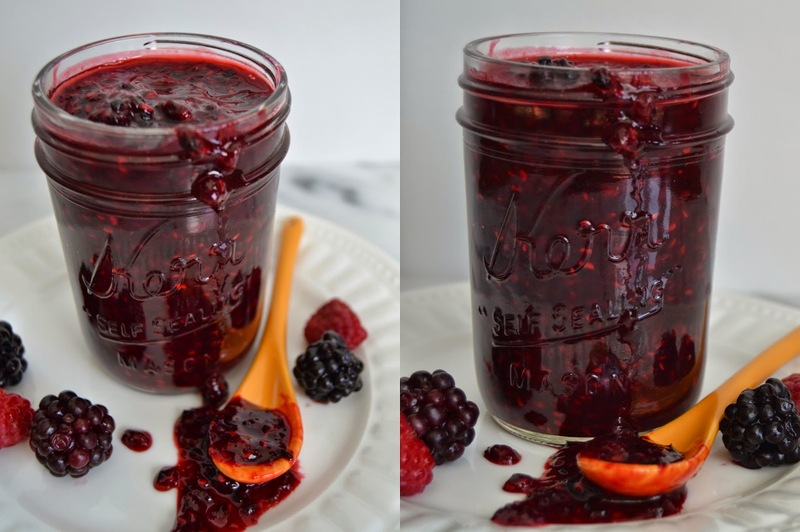 Since the berries were frozen, I decided to cook them down into a jam. I knew it would be the perfect compliment to the ice cream. 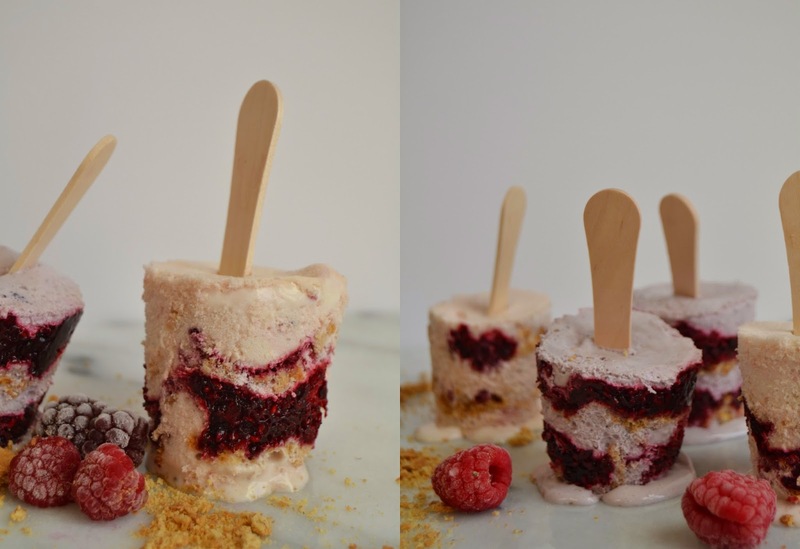 Once I had the sauce cooked, I decided to make a layered popsicle inspired by this post from Cupcakes & Cashmere. 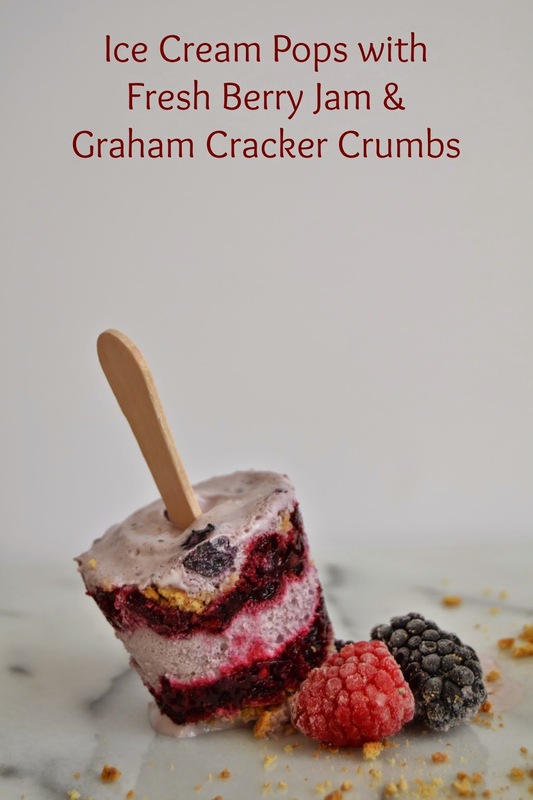 I don't know about you, but one of my favorite fro-yo toppings is graham cracker crumbs. And since I had some graham crackers leftover from camping, I decided to incorporate that into my pops as well. 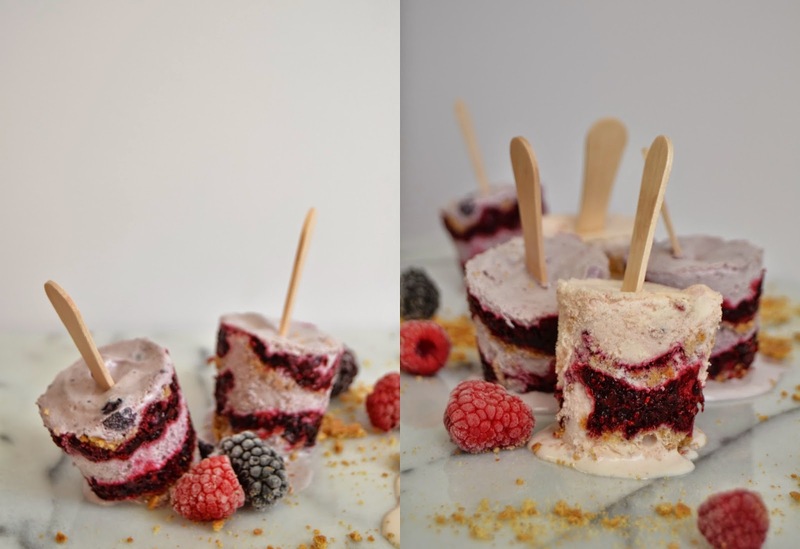 I love the layered look of Emily's cappuccino pops and I wanted to create a similar effect with my Ice Cream Pops. These were actually really fun to put together, and quite easy too! They would be perfect to serve for dessert at a dinner party or BBQ. Even though they're quite simple, the fun layers and flavors make them feel festive. And the best part, you can change the ice cream flavors and layer your favorite toppings to make them unique. Place berries, sugar, lemon zest and lemon juice into a sauce pan. Heat over medium/high heat and bring to a boil. Reduce the heat and simmer for about 20 minutes, stirring frequently. When finished, it will be reduced to about half. I used a wooden spoon to break down the berries as they cooked. You could also puree them before cooking or with an immersion blender afterwards if you wanted a smoother consistency. First, take the ice cream out of the freezer about 10 minutes to let it soften a bit. 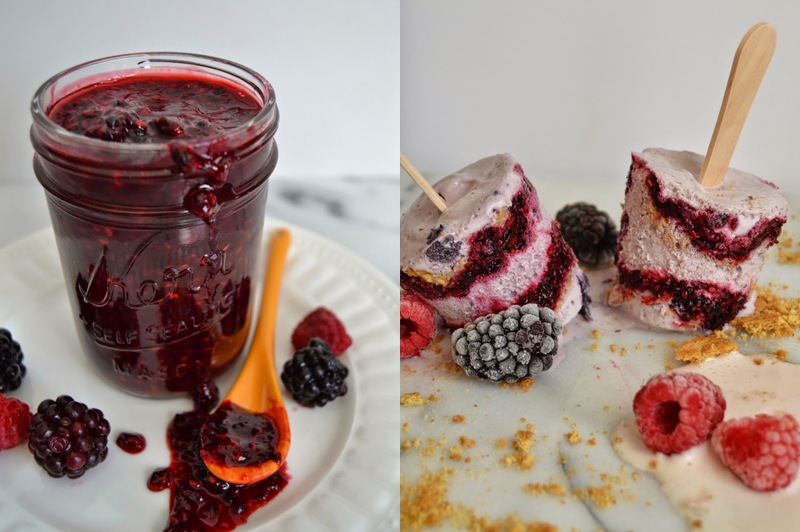 Then, line up your cups, graham cracker crumbs, and berry jam. Once the ice cream has softened, put a large spoonful in the bottom of each cup. Next, place a spoonful of graham cracker crumbs on top of the ice cream. Shake the cup so that the crumbs evenly cover the first layer of ice cream. Next add a spoonful of jam, spreading to make an even layer. Repeat this process until you fill the cup, ending with ice cream as the top layer. 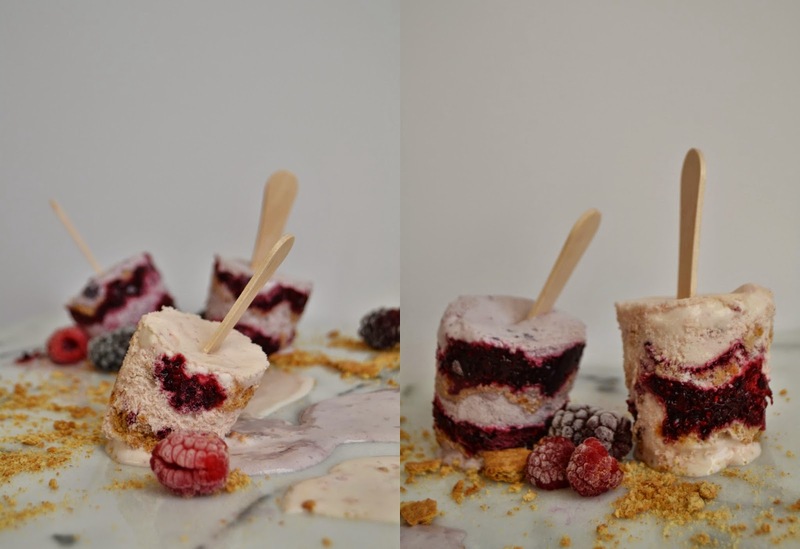 I got about 3 layers of ice cream (two of graham crumbs and jam) in each of mine. Once the cups are filled, insert the ice cream stick and freeze. Freeze for at least a few hours or over night to set. When you're ready to eat one, simply peel the paper cup away from the popsicle, and enjoy! *I placed my cups in a glass baking dish to keep them from falling over in the freezer. the cleanup after shooting - popsicles don't last very long in direct sunlight! Oh my gosh friend, these look SO delicious!! What a great recipe. Thank you for sharing. I am always looking for new ways to try jam. I can’t resist the gourmet jams from The Berry Farm and always end up buying too many when we visit. I’m going to try your recipe with blackberry and orange jam rather than make my own jam like you did. Wish me luck!